Sustainable buildings are playing a critical role in the development of many emerging economies. India’s Sustainable building market is estimated to double by 2022 at 10 billion sqft, valuing around USD 35-50 billion, driven by increasing awareness level, environmental benefits and government support. India has emerged as one of the leading countries in terms of sustainable building projects and ranks only second after US in terms of number of green projects and built-up area. Still this is only about 5% of total buildings in India, and hence there is huge potential for further penetration of sustainable building design. 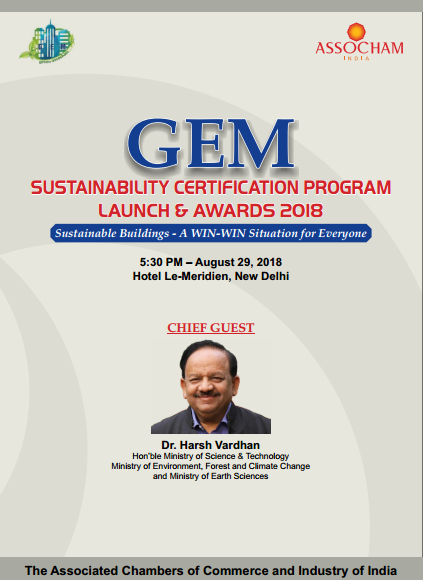 In order to complement in India’s Sustainability Movement and take it to the next level, ASSOCHAM is launching the GEM Sustainability Certification Rating Program for buildings and other related developments on August 29, 2018 at Hotel Le Meridien, New Delhi. Inaugural Session will be followed by the “Award Ceremony” for the ASSOCHAM Certified Sustainable Buildings. We are pleased to inform you that Dr. Harsh Vardhan, Hon’ble Minister of Environment, Forest and Climate Change, Science & Technology, Earth Sciences will be the Chief Guest of the Program. On behalf of ASSOCHAM, we would like to take this opportunity to invite you to the program and grace the occasion. The program will start at 5:30 PM on August 29, 2018 at Hotel Le Meridien, New Delhi. We would also request your organization to be the PARTNER / SPONSOR for the event as per details enclosed for your kind reference. We hope and trust that our request will merit your kind consideration.